Don't miss this 57' Grand Harbour downeast express yacht for sale! 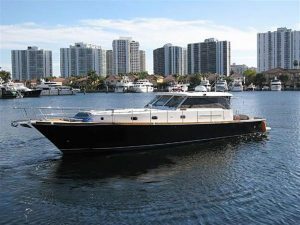 : Atlantic Yacht & Ship, Inc.
Don’t miss this 57′ Grand Harbour downeast express yacht for sale! Located at Isles of Palm, Brad Nelson has a 58′ Grand Harbour express yacht for sale! In the first place, this 57′ Grand Harbour is known as “Tillerman.” Moreover, this 57′ Grand Harbour is equipped with both U.S. and European (International) specifications. Exquisitely crafted interior woodwork utilizing contrasting Teak or Cherry and burl finishes. Fully found, fitted out for extended cruising and low overall height makes Intracoastal and Great Loop cruising an easy affair. All that you need to enjoy life on the water, ample entertaining space and sun areas on the full width bench seating aft and sun pads on the foredeck. As can be seen, this yacht has quality craftsmanship. And all materials and machinery are what one would expect from a Custom 57′ Grand Harbour. Furthermore, this yacht has all new LED lighting throughout. After all, the underwater Exhaust and spacious saloon add to the comfort of being on board. The saloon doors open to the aft deck and a sound system with Bose speakers throughout. The dining table is located adjacent to the galley. In summary, this yacht has a two stateroom, two bath layout. She compares favorably to the quality of Alden, Sabre, Eastbay, and the many custom Downeast style cruisers. For more information on this lovely used 57′ Grand Harbour yacht for sale be sure to contact Brad Nelson today! Do not miss this beautiful used 52′ Krogen Express yacht for sale!